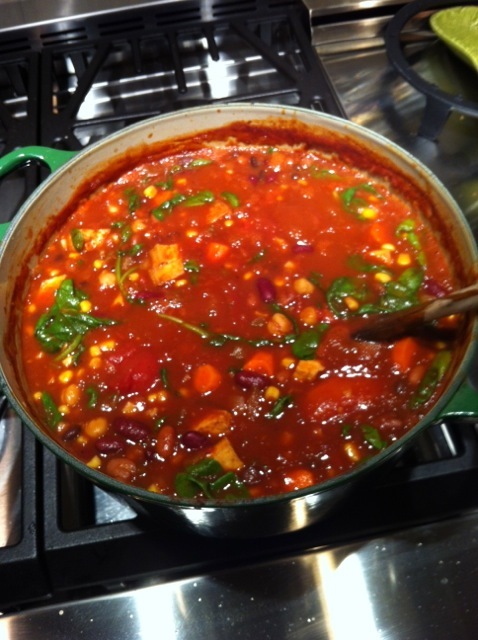 Due to my sister’s unfortunate absence I will be guest posting again this week with our vegan chili recipe. It does have a lot of possibilities for adding or removing vegetables depending on taste and can be seasoned differently depending on preference. I made this last night and first baked the tofu with toasted sesame oil, then put onion, green pepper, carrots, spinach, garbanzo beans, black beans, corn, kidney beans and tomato plus spice and garlic in the chili. We served this with whole grain bread and it was delicious! A bit on the sweet side, so if desired you can leave out the corn and carrots, or serve over brown rice for a nuttier flavor. Hope you enjoy it too! Preheat oven to 425 degrees. Lightly spray a baking sheet with oil and arrange the cubed tofu in a single layer. Place on middle rack in oven and bake 15 minutes. Gently flip the cubes, then return to the oven to bake another 15 minutes. Remove from oven and set aside. Heat the water in a large saute pan. Add the onions, green peppers, carrots and garlic and cook until tender. Add the tomato paste and stir. Add all of the beans and corn and peeled tomatoes. Season with chili powder and cayenne if desired. Bring to a boil then reduce to a simmer and cook for 30 minutes. Add spinach and cook until wilted. Serve immediately. This entry was posted in Main Dishes, Meatless Monday and tagged guest post. Bookmark the permalink. I love anything that I can throw a bunch of vegetables in yet not feel like I’m eating a bunch of vegetables. I’ll use about eight times the chili powder, though! And also a pound of meat. Mwahahahahaha. Can’t say how grateful I was to Suzanne for posting for me. She also wowed our family during vacation with her vegan pot pie, made in the SLOW COOKER of all things! Which reminds me, I must get that recipe.. Thanks for posting this Chris! We have really been enjoying the vegan lifestyle and exploring new ways of cooking. I will stay tuned for more suggestions from your website. Awesome, babe! And THANK YOU for posting for me, you rock! You can’t go wrong with chili. And throw in some cornbread, it’s a party! I was wondering if Christy was alright? This is your long-lost (sad sack of a friend) Christy. I cannot thank you enough for checking in on me this summer. I’m so sorry to have worried you and hope that you aren’t mad. You are a true, kind, and generous soul. I’m not worthy! Also hoping Christy is alright. I’m missing her amazing recipes. I was wondering if she was ok. I have Meniere’s as well just hoping everything with her is alright. Meniere’s for me too. The Daily Dish website has been the most helpful of anything I’ve found and her amazing story gives me hope that I won’t lose my sense of self to this rotten disease. I’m super worried by her absence. Thank you Leah! You are so kind as well and I thank you for taking the time to check in on me! I’m so sorry to have worried you and am so thankful to have been missed. It makes my heart so happy to know that this site makes life better for other people.